Ricky Gervais Was Mean! Boo hoo! 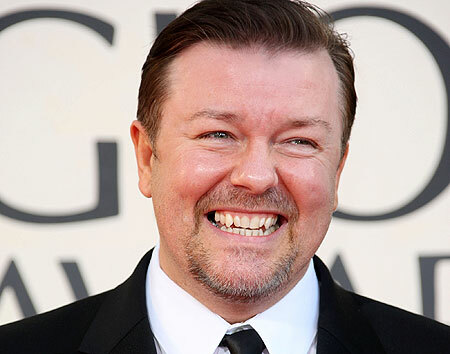 Much has been made of Ricky Gervais’s performance as host of the Golden Globes. Ricky Gervais was mean to some people at the Golden Globes. Like that's a crisis. He had snarky remarks about many of the celebrities there and apparently, feathers are ruffled, to say the least. You have to be especially careful with “news” coming out of Hollywood, because so much is untrue, but there are reports that some celebrities complained to the Hollywood Foreign Press, which runs the Golden Globes. Gervais supposedly will never host the awards show again, and is rumored to be subject to some sort of rule that he will never be nominated for a Golden Globe. All because Gervais said somebody’s movie stank, or an actor’s personal life was, shall we say, dissimilar to Mother Teresa’s. Yes, I’m sure Gervais brought up some personally painful things, and nobody likes to be insulted. But we need to stop hyperventilating here. He told a couple mean jokes. He didn’t kill anyone, damage anybody’s career, except maybe his own. But a Hollywood awards show is the world’s biggest collection of huge, mondo egos. I’m sure many of the celebrities are down to earth, but I’m certain some of them feel so entitled to worship than any little insult is the equivalent of being shot. With snots. I don’t know. I’m not a glutton for punishment. But if somebody wants to insult me in exchange for the zillions of dollars some of these actors and performers make, go ahead. Make my day. This entry was posted on January 18, 2011 at 1:50 pm and is filed under Uncategorized. You can follow any responses to this entry through the RSS 2.0 feed. You can leave a response, or trackback from your own site. And it was funny(?) that last night on Entertainment Tonight they didn’t even mention his name… were they told that if they repeated his jokes (like CBS Evening News did) that “stars” wouldn’t come on ET? I completely agree. Get a sense of humor folks and if you don’t like being the center of a joke, then don’t become a public figure.